The future roadways for Interstate 840 at Joseph Bryan Boulevard. This section opened to traffic on December 6, 2017. Photo taken 12/15/16. 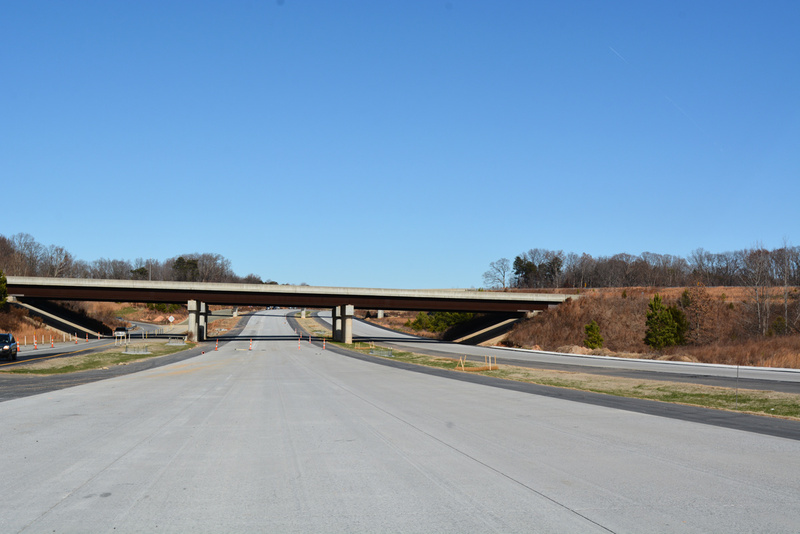 Interstate 840 follows completed sections of the Greensboro Northern Loop. Located within the Triad region in north-central North Carolina, I-840 will eventually form a complete loop around Greensboro from I-40 and I-73 by Piedmont Triad International Airport (PTI) to the west and the exchange of I-40, I-85 and I-785 near Stewarts Mill to the east. Interstate 85 comprises the southeastern quadrant of the Greensboro Loop. The 13-mile section opened to traffic in February 2004.1 Completed by February 2008, the southwest leg of the loop is a part of Interstate 73. The 44 mile long Greensboro Urban Loop originated in a late 1940s transportation plan to add a parkway encircling the city. It was later named Painter Boulevard, after a former city manager.7 The initial section of Interstate 840 completed was the two-mile segment north from I-40 and I-85 to U.S. 70. Located east of Greensboro and initially signed as Future I-840, the segment opened to traffic in 2002. Subsequent construction for Interstate 840, between I-40 west of Greensboro and Joseph Bryan Boulevard, was underway during the week of September 8, 2003. The $101.6 million project was expected to open to traffic by Summer 2007, but was delayed until February 21, 2008. 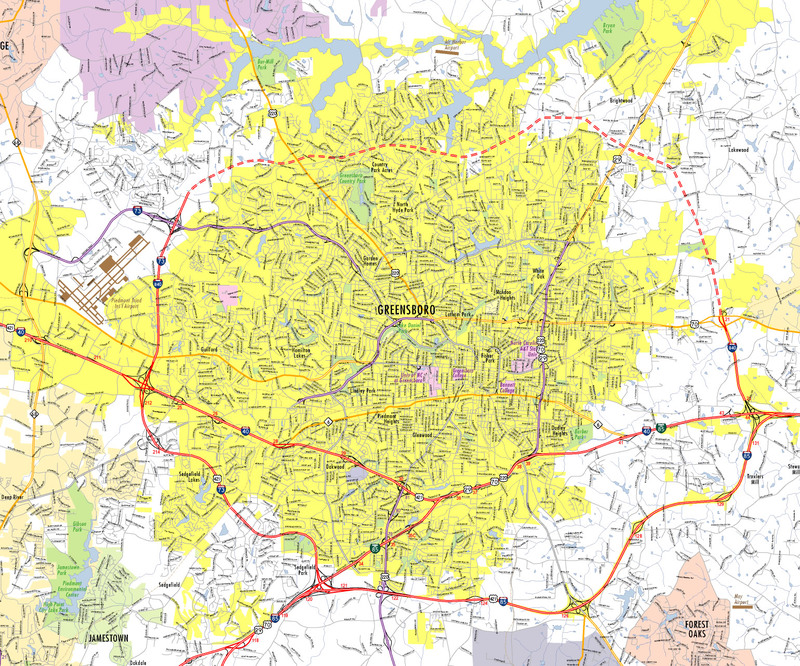 Citing potential benefits to Piedmont Triad International Airport (PTI) area traffic congestion, this leg of the Greensboro Urban Loop was prioritized by state officials.2 Upon completion, the west leg of the loop was dually signed as Future I-73 and I-840. The Greensboro beltway carries U.S. 421, I-73 and I-85 along the southern half. I-73/840 overlap north to Bryan Boulevard. I-785 accompanies the east leg of the loop to connect with U.S. 29 north toward Reidsville. Interstate 840 north at U.S. 70 and the temporary freeway end east of Greensboro. The freeway opened north from here to U.S. 29 on April 19, 2018. Photo taken 12/15/16. Interstates 785 & 840 trend eastward from the Clapp Farms Road overpass to the directional cloverleaf interchange (Exit 21) with Interstate 40. Photo taken 12/15/16. 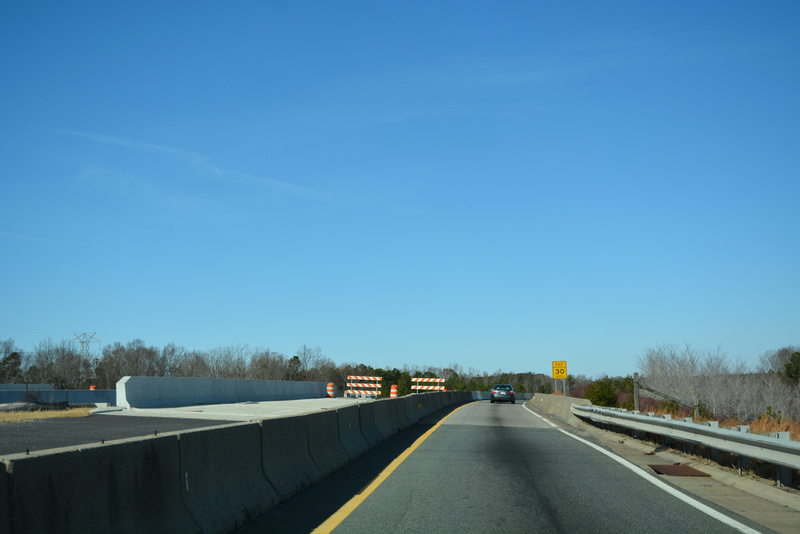 Exit 21 partitions from the freeway mainline for I-40 west into Greensboro and east with I-85 north to Burlington. A wye interchange follows, taking Interstate 785 south onto I-85 south toward High Point. Photo taken 12/15/16. Signs installed in 2017 added Interstate 785 for Exit 227, where I-40 east meets both I-85 south back toward High Point and I-840 north to U.S. 70. Photo taken 12/15/16. Interstates 785 and 840 overlap north from I-40 to U.S. 29. The U.S. 29 corridor doubles as Future I-785 northeast from the Greensboro Loop to Danville, Virginia. Photo taken 12/15/16. Passing over Market Street, Interstates 73 & 840 progress southward with three lanes to the directional cloverleaf interchange (Exit 1) with Interstate 40 and U.S. 421. Photo taken 12/15/16. Motorists headed west on I-40 & U.S. 421 to Winston-Salem or east on Interstate 40 to Downtown Greensboro depart in unison from Interstate 73 south as I-840 west ends. Photo taken 12/15/16. Having just partitioned with a three-lane ramp for the Greensboro Loop south (I-73 & U.S. 421), drivers along I-40 east next reach a loop ramp (Exit 212B) for I-73 & 840 north to Joseph M. Bryan Boulevard. Temporary guide signs were posted prior to the completion of I-73 along the N.C. 68-U.S. 220 Connector in 2017. Photo taken 12/15/16. 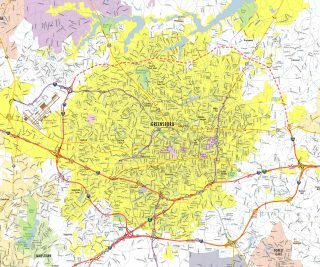 “Western section of Urban Loop slated to open next.” News & Record (Greensboro, NC), December 8, 2017. “Work to begin this week on new section of Greensboro loop.” News & Record (Greensboro, NC), September 10, 2003. “New section of Urban Loop in Greensboro open for traffic.” News & Record (Greensboro, NC), April 19, 2018. “Eastern Section of Greensboro Urban Loop Now Open.” WFMY News 2 (Greensboro, NC), December 6, 2017. “Greensboro Urban Loop Work Moving Faster Than Expected.” WFMY News 2 (Greensboro, NC), October 18, 2018. “Urban Loop becoming reality for some, looming for others in Greensboro.” News & Record (Greensboro, NC), December 22, 2018. Page updated February 3, 2019.